Blogs, networking sites, and other examples of the social web provide businesses with a largely untapped marketing channel for products and services. But how do you take advantage of them? 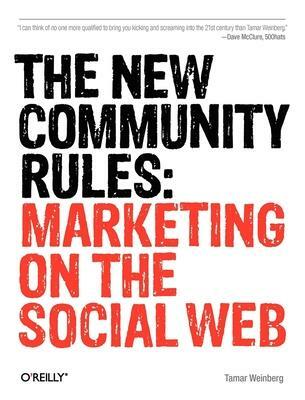 With "The New Community Rules", you'll understand how social web technologies work, and learn the most practical and effective ways to reach people who frequent these sites. Written by an expert in social media and viral marketing, this book cuts through the hype and jargon to give you intelligent advice and strategies for positioning your business on the social web, with case studies that show how other companies have used this approach. "The New Community Rules" will help you: explore blogging and microblogging, and find out how to use applications such as Twitter to create brand awareness; learn the art of conversation marketing, and how social media thrives on honesty and transparency; manage and enhance your online reputation through the social web; tap into the increasingly influential video and podcasting market; and, discover which tactics work - and which don't - by learning about what other marketers have tried. Many consumers today use the Web as a voice. "The New Community Rules" demonstrates how you can join the conversation, contribute to the community, and bring people to your product or service. Are You Ready for Social Media Marketing? When Should I Pursue Social Media Marketing? When Is It Appropriate Not to Respond at All? How Do You Monitor the Conversation? You re Listening What Now? In general, readers new to social media will enjoy an extensive introduction that accurately describes the current state of Internet communities and provides significant insight into the historical trends that have led us into the Twitter age...One step toward achieving a well executed social media marketing campaign involves understanding the best ways to engage communities. Weinberg's book is a great place to start. -- Armando Roggio, --Armando Roggio Want the nitty gritty details of social media success? Weinberg (the Queen of Smart) has literally hundreds of great tips in this book. -- Steve Cunningham, --Steve Cunningham I think what readers will find expecially useful is the straightforward and example rich approach Tamar takes in explaining how companies and individuals can succeed towards marketing goals through thoughtful participation. Getting advice from someone who has 'been there, done that' can save a substantial amount of resources, money and shorten the time to get up to speed. -- Lee Odden, --Lee Odden ...a heck of a book. -- Chris Brogan, --Chris Brogan ...a heck of a book. Tamar Weinberg is a writer and internet marketing consultant specializing in blogger outreach, viral marketing, and social media. She maintains a personal blog about all things social media at www.techipedia.com. She is based in New York City.